Satellites and new technology have enabled our culture to become more global than ever. In our text, Practices of Looking, the author refers to us as “global citizens.” We are so used to knowing what is happening in the world around us and being under constant surveillance that we hardly even realize that this is new to our generation. Many times what we think we may have done in private is far from private. This has led to some very negative experiences for many and the concerns are valid. However, the shift from small town happenings to global awareness and tracking have helped a few families find children who have been abducted in a world so large that this would not have been possible prior to this global citizens’ era. The trend of businesses throughout the developed world has been to have security systems that have surveillance cameras in place. Although there are not a lot of statistics available of the success of these systems, common sense and news stories often stand alone in telling the tale. Criminals are often caught because they are videotaped in action. This has to make some criminals think twice, because the fear of getting caught is a strong deterrent. Regardless of whether it has slowed down crime, it is a trend that has exploded. Most businesses have some type of surveillance. As a result, we are constantly being monitored and recorded. One benefit beyond security and catching criminals is rescuing abducted children. Although it has not helped a ton of families rescue their missing children, it has helped a few. Prior to this trend of surveillance, finding a lost child was primarily objective. The searchers would have to make their best guesses about where to look. Even though there is still a lot of guess work involved in locating lost children, there has been a shift to a more subjective way to search. There are two advances in our global culture that help make the objective search more subjective. The first is the ability to look at the videos of a suspected siting and confirm if it is really the missing child. 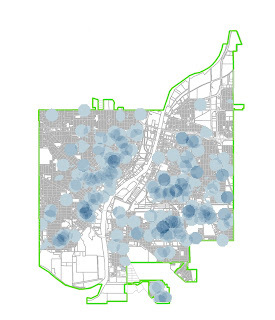 The second is the ability to broadcast the search into the homes of people everywhere. When there is a confirmed siting, the people in the area can be made aware and help in the search. This positive outcome in the “satellite panopticon” of our ability to observe and be observed everywhere has made life better for at least a handful of families. 1) The most recent miracle was the case of Brittany Smith. 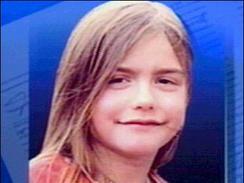 Her mother was murdered and she was allegedly kidnapped and taken out of her home state, Virginia. December 6 she was seen on camera at a Wal-Mart in California. CNN aired the story. 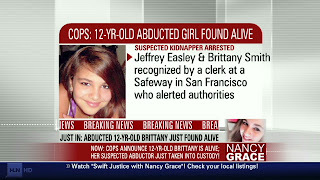 “Recognizing their images from CNN, a San Francisco supermarket clerk alerted police after spotting a Virginia girl and her alleged abductor,” according to police. The girl was found safe and the man with whom she was found was arrested. This girl may not have been so fortunate had authorities not been able to identify her and post alerts in that area. 2) In 2005, Shasta was kidnapped and missing for seven weeks before she was rescued. She is another fortunate victim who was rescued because of cameras. There are over 800 satellites surrounding our planet that advance technology to a new level of surveillance that is almost inconceivable. Through surveillance and other technologies the world has become very global. We have the ability to monitor and keep track of what is happening just about everywhere. These trends have become so much a part of our culture that we barely realize it. What we knew about the world used to be much more objective. Through video and personal experience we have a much more concrete basis for our thinking. Our thoughts and feelings are intertwined with information from around the world through our television in our homes. This awareness has shifted how we experience life. Although the intended use of most surveillance videos is to protect us from criminals or at least help apprehend them after the fact, there beneficial use extends beyond the intent. Satellite technology also had its origins in the protection of citizens. These advances in technology are interwoven into our postmodern culture. Ironically, in a world where the original intent and success of the inventions and use was to minimize crime, these devices and technologies sometimes allow for other invasion type crimes to be committed. However, the examples above show how video surveillance technologies along with the ability from satellite to broadcast those pictures have enabled authorities and citizens to be directly involved in the rescue of abducted children. The trends that have made us “global citizens” have made our world safer and in these cases have given a few families a modern day miracle. The Cheezburger Network is a network of related websites which pull together photos with captions. Mostly these pictures show something funny occurring. In fact, that is the main focus of each of these websites: finding the funny in everyday life and everyday photos. People send in pictures, people vote on which captions are the funniest, and these photos with captions are posted on the main page, much like a post on a blog. This network of sites is all about the Global Subject and the Global Gaze. The resources the technologies provide are simply funny pictures for people to look at, but they provide much more than that. One example of a good thing that these sites provide is they connect people to each other in a positive way. While the viewer may not know the creator/s of the image personally, it connects both people to each other with laughter, or whatever other reaction the viewer may have. And the creator gets the pleasure of knowing that he or she probably made someone laugh very hard at least once that day. 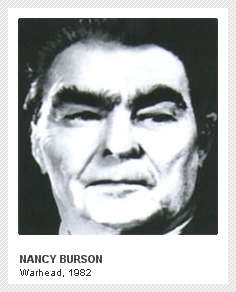 Another good thing these sites do is express a current culture in an extremely current fashion, and also archives such culture. Not only do each of these pictures show what people are thinking about on any given day, but also what a huge number of people are looking at right at that very moment. It catalogs the gaze of people, and the reactions of the people commenting, in real-time. However, it also has some drawbacks. For example, one of the sites in this network is called Wedinator. It shows some pictures of some dubious ideas for weddings, sometimes with captions. While many of these pictures can be very funny from an objective standpoint, from a subjective standpoint (the standpoint of the people whose weddings those actually were, or someone who's thinking of doing the same thing for their own wedding perhaps), making fun of such a personal thing is offensive. I'm sure if I had a Star Wars wedding I would be offended to see it made fun of (though to be perfectly honest I would probably expect such derision—it's a super geeky thing to have as the theme of a wedding, and some might consider it tacky). The point is, the photos can very often be offensive without regards to the subjects within them. Also, I'm sure that many photos are used without the owner's permission—although, this may be something that the owners or subjects might not care about, if their photo is used to make something amusing enough to make it alright (take lolcats, for example—the subjects in the photos are unable to complain). Still, it's likely that the photos are used without permission—and there's nothing to stop people from using them, really. How this technology is likely changing how we view ourselves is just like it says in the book: it's mixing the objective and the subjective; making us see ourselves in other people and other people in ourselves. We see ourselves from the outside and at the same time, see other people's inner workings. In terms of the Cheezburger Network, we're seeing ourselves being made fun of, other people being made fun of, and just generally silly and hilarious everyday things. One controversial area that relates to Michel Foucault’s vision of the global gaze is the technology and use of public surveillance cameras. By utilizing surveillance cameras, governments are able to keep track of the public’s activities and are thereby able to control and discipline them when necessary. Many businesses and governments are employing these resources with the intention of reducing crime and/or to catch criminals in an illegal act by recording their actions and behavior. From the panopticism point of view in that individuals can always be observed by the guard tower yet don’t always know they’re being watched, the consideration of public surveillance cameras being a violation of one’s Fourth (and First) Amendment rights must be reviewed. Most individuals know that they are being watched when shopping or walking in a public place. It is one thing for a business to place cameras in their place of business and in parking lots with the intention of deterring crime or for a city government to place multiple cameras at an intersection to monitor public traffic; however, are one’s rights in violation if a camera is placed in a position (such as an alleyway) where the actions of an individual in the privacy of their home or backyard is suddenly called into question? In a landmark Supreme Court decision, Katz v. United States 389 U.S. (1967), the modern definition of the Fourth Amendment’s “search and seizure” law was defined. The court declared that “what a person knowingly exposes to the public, even in his own home or office, is NOT a subject of Fourth Amendment protection, but what he seeks to preserve as private, even in an area accessible to the public, MAY be constitutionally protected. Generally, a person walking along a public sidewalk or standing in a public park cannot reasonably expect that his activity will be immune from the public eye or from observation by the police.” The Court further defined that in United States v. Knotts 368 U.S. 276, 281-282 (1983), “a person traveling in an automobile on public thoroughfares has no reasonable expectation of privacy in his movements from one place to another. When that individual traveled over the public streets he voluntarily conveyed to anyone who wanted to look the fact that he was traveling over particular roads in a particular direction, and the fact of his final destination when he exited from public roads onto private property.” It is this reasoning that police are able to record individuals on public roads. The gist of it all is that when an individual is in a public place, they have the expectation that they are being watched and/or recorded. Public surveillance cameras placed in a position where an individual’s private world is being recorded, despite the reason why, is a clear violation of one’s Fourth Amendment right to privacy. In the postmodern world, the placement of surveillance cameras has to be questioned. Just because the technology exists does not mean that the institutions in power should execute it in any manner that they deem necessary. The privacy rights of individuals must be protected and guidelines must be incorporated, reviewed, and protected. In theory, cameras have the ability to deter crime, increase public safety, and provide evidence in criminal matters; however, invasion of privacy and the possibility of the image misuse are also viable issues and unfortunately, there are not studies to measure how effective utilizing public surveillance cameras are in the deterrence of crime. Cultural Imperialism is defined as "...how an ideology, a politics, or a way of life is exported to other territories through the export of cultural products." Here is one prime example of that. 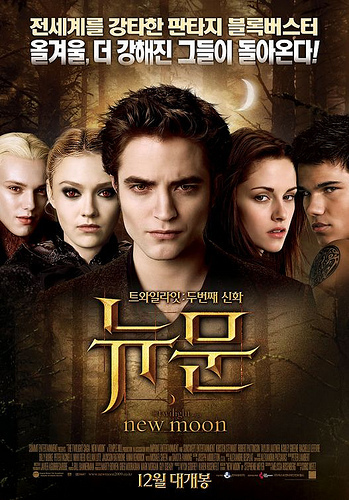 Above are two pictures of The Twilight Sagas movie--New Moon--in Korean in the top photo, and Japanese directly above. 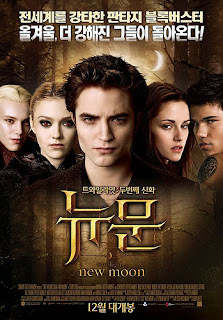 As New Moon and the Twilight Saga ultimately being a love story, these photos show the movie's exportation to Korea and Japan as also an export of America's youth's idea of ideal love. The love story then becomes applied not only to the youth of America as an ideal, but also to the youths of other countries. And this is not the only example; it's just the only example I could find a picture of. Basically any movie made in Hollywood finds its way to other countries nowadays. Hollywood has something of a niche market in movies, and as such, its products generally find their ways into other countries in today's global society. It may not be that Hollywood or other American movie makers are intentionally trying to impose their views on other cultures, just that in today's world, they find their way there anyhow.
" I'm a person who had a dream and was lucky enough to make that dream a reality—a dream of a worldwide network of women who would be both givers and receivers. A dream of an organization that would be open, curious, inclusive and trusting. A generous organization, that would work evenhandedly with women's groups around the world, with donors and volunteers, with staff and with others who joined our path. I came to believe in my nine years creating the Global Fund that it is vital to transform the world by changing the way people treat each other, and by modeling that kind of change behavior ourselves. We can count the achievement—the number of grants and donors, the amount of money raised—but I truly believe that the way we have done our work has been as important as what we have done." She was succeeded by Kavita N. Ramadas. · Violence against women – Support programs that offer services to victims and raise awareness of their rights. · Health – Education about basic health and sanitation and ensure good public health policies. · Leadership – Help women to become involved in leadership in all levels of government. They are active in 171 countries and give grants to groups who submit proposals. Of the 3000 requests they receive each year, they are able to fill about 500 requests. Each grant is between $500 and $20,000. They are funded by donations. The following table show the percentage of the flow of money. 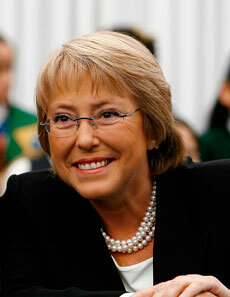 They are involved with larger organizations like the United Nations in promoting rights for women. They also have links to several global social networks. The United States and a few other places in the world have promoted women’s rights for years. Organizations united across the globe are trying to help women achieve similar freedom and rights. Global Fund for Women started in 1987 and has been successful in advancing awareness to the concerns of women internationally. They have a specific agenda and join with other similar organizations that are also trying to make a difference in the world for women. They use marketing through radio, television, and newsletters and social networking online to bring awareness of their efforts and gain new members and raise more money. They hold events throughout the world promoting rights for women. For example, in November of this year they were in Durfar. Organizations like this one are gaining ground by promoting awareness throughout the world and in turn new organizations are founded to promote women’s rights. They have been successful. Visual images and the media help shape the globalization of capital through global niche markets in which a sharing of a cultural identity is exchanged from country to country. Some media examples are television networks such as the Spanish channel "Telemundo" that is geared toward Spanish-speaking individuals around the globe. 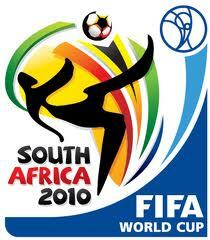 One unique example is FIFA, the Federation Internationale de Football Association, a worldwide soccer organization for men, women, and children. The sport of soccer unites individuals across numerous countries around the world. It has its own culture, its own visual language, and it shares an identity with its global audience. Fans are passionate about the game and view the competitions as exercises in country loyalty and strength. Games are broadcast around the world and even though the languages may vary, the images of the game and the rules are universal. Video games, websites, and films are dedicated to the sport with great anticipation. Founded in Paris in 1904, FIFA became the official global organization to oversee the popular sport and to date recognizes 208 national associations. FIFA even has its own anthem composed by German composer Franz Lambert in 1994. Adding to the global market is the sponsorship by such international giants such as Adidas, Coca-Cola, Emirates, Hyundai-Kia Motors, Sony, and VISA. As the Internet continues to spread and provide access to information and ideas from around the world, we need a way to search through that information. Google has emerged as a global company by providing the ability to translate results into more than 125 different languages and provides a portal to the Internet in 183 countries. http://www.google.com/language_tools?hl=en This has made the internet available to developing nations and helped to break through the language barrier creating a global village. Google is also markets many products under one company name on a global scale, referred to as Google Apps. These Apps include Google Maps, Gmail, Blogger, and hundreds more and they help us to use information from and contribute information to the Internet. Google has also worked for global free expression, and includes many posts on their official blog concerning free expression. http://googleblog.blogspot.com/search/label/free%20expression They recently participated in the Internet at Liberty 2010 conference discussing freedom of expression on a global scale including representatives from countries where free expression is often frowned upon and regulated by governments like the Middle East and Africa. Some nations have attempted to limit their nations access to the Internet and the ideas it contains. Google has also introduced a new tool in the fight against censorship by developing a new tool that shows the requests that they have received from world governments to provide user data or to remove information from search results. http://www.google.com/transparencyreport/ They have also worked with some repressive governments, including China, to provide Internet search capabilities to their citizens. 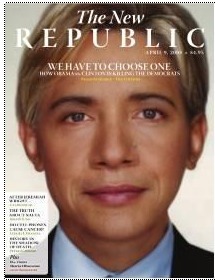 In this picture, it takes features from Hillary Clinton and President Obama and combines them to make the new look. It shows how digital systems can take the human body and change it to represent a concept. The caption on the front of the magazine where this picture was displayed states, “We have to choose one.” So it is used as a political statement. I think the concept might be that if you could take both of their good ideas and mix them it would be better, but you can only choose one or the other. It reminds me of trying to find the “perfect man”; it might take a blending of sorts!!! This is a picture trying to depict evolution. 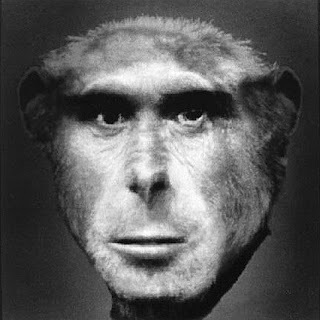 The picture shows what a human might look like in the in-between stage. The picture is used to attempt to validate a “scientific” point as though the human body is capable of whatever technology is capable or reproducing. It is promoting the concept of evolution. This is a picture that just shows technology can produce a believable image of a human that is not a real depiction of anyone. The body parts are assembled together but come from many people. I don’t think there was an agenda. It is just an example of what can be done. This series of images is morphing a human to a cat. The middle image is similar to the one above demonstrating the concept of evolution except there is really not an agenda. No one thinks we came from cats. This is an example of cyborg - part technology and part organism. The human genetic body can be contrasted to these digital images because they are representative of the convergence of technology and photographic imagery and convey the idea of an emerging, more perfect figure. For example, the first photo is a combination of Hillary Clinton and Barack Obama during the ’08 campaign and suggests that combining the two would represent the perfect presidential candidate that is neither male or female but an ideal democratic representation for the country—the proposed best of two worlds. This blending of difference crosses the cultural border and is meant to appeal to a much wider audience although it is fictional at best. The cultural expectation of this image suggests that among popular and controversial candidates, there is no “perfect” choice. 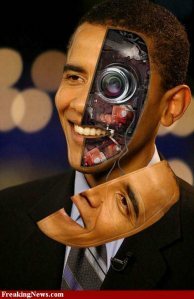 In contrast, the last image of Obama represented in a cyborg sense conveys the editorial idea that human beings in power are nothing more than contrived robots lacking human compassion and emotion (one interpretation). This idea, however, could not have been suggested visually without the convenience of technology. This image clearly is subjective as it utilizes the science of technology to advance a hardened and negative political initiative. Although some good can come of making the public aware of their medical options, by bypassing medical personnel and speaking directly to consumers, you remove an important buffer. Medical personnel will look at the sum of symptoms and ailments and prescribe a medication that best fits all of the ailments, whereas a consumer is likely to believe that they may require many more medications that may not provide any benefit at all. This also can lead to an increase in hypochondria and self-diagnosis because consumers may experience a few of the generic symptoms listed and may begin to believe that they have a deadly illness. The inverse can also be true, where someone may not currently exhibit one of the listed symptoms and feel that they do not need to see their doctor. When pharmaceutical companies make abstract promises, it means that it falls on the medical professional to tell a consumer that the medication advertised will not work for their indications. This makes the doctor the bad guy and causes distrust to form in a relationship where trust is needed. Promoting pharmaceuticals outside of a medical context is ethical, however it makes a physician’s job more difficult. By encouraging a patient to ask their doctor, you increase the strain on the healthcare industry At the same time patients are made aware of important medical issues they may never have talked to their doctor about because of a lack of education or embarrassment. 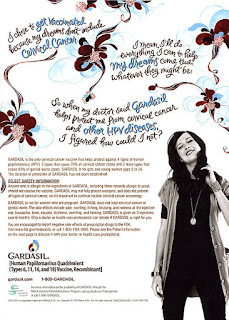 The Gardasil ad shown creates a sense of fear in young girls that if they don’t get this vaccine today, they will get cervical cancer in the future. This type of fear pressure makes it seem like it is worth it to risk the side effects, both known and unknown, in order to escape a future with cervical cancer. This ad also makes it seem like this vaccine will guarantee a future full of happiness and possibilities, since she will do everything she can to help her dreams come true. The small print in the ad reminds potential users that this vaccine does not guarantee against cervical cancer doesn’t work at all for some variants of the virus, so routine screenings are still required. It also includes a long list of side effects and a phone number and website to report any additional side effects experienced, since this vaccine is quite new on the market. 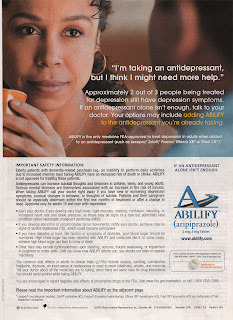 Abilify is an antidepressant. However, it is a special kind of antidepressant, one that you can only take with other antidepressants. That’s right. Is your current antidepressant not quite doing to trick? Not to worry! The solution to your problem with drugs is more drugs! This advertisement is meant to speak to people who are suffering from depression and anxiety. It says, your current antidepressant is supposed to do everything to make you feel better. If it’s not, then you need our drug. Add it on to yours and it will make everything better. The claims this drug makes effects the people they’re advertising to by telling them that their depression should be cured entirely by the medication when that’s not true at all. I speak from experience when I say that the drugs are about half of the process of overcoming depression and anxiety. This ad says that drugs are the cure, and that is simply not true. This affects the medical personnel in that they lose the position of having the best advice. 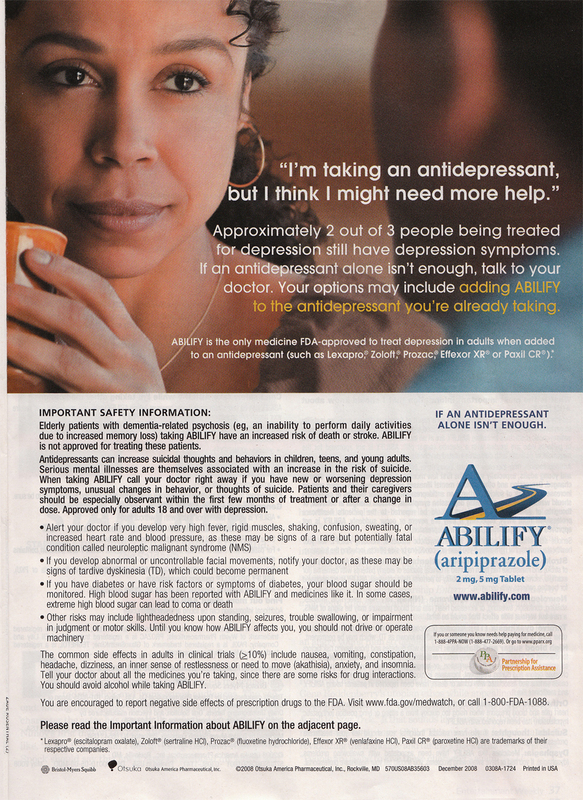 The patient may see the ad, and wonder why the doctor did not prescribe this drug—he/she so clearly has this ailment!—when there may in fact be other reasons for not prescribing it. Such as interference with other drugs the patient is on or an allergy or the fact that the doctor believes the drug will do more harm than good. The advertisement of this drug outside of a medical context is a double-edged sword. It could actually help the patient. But then it could also do harm. Leaving the power of decision in the hands of the uneducated consumer rather than the educated doctor might lead to problems. But then it could also help if the doctor had not thought of prescribing such a drug. It could go either way. "Flattening of affect" of each of the characters as the sum of their quirks rather than deep personalities. Also, at one point, Scott's ex-girlfriend's (Envy is her name) new boyfriend, who is Ramona's ex-boyfriend, gets killed and turns into a pile of coins. Envy calmly says "You just punched my boyfriend so hard he disintegrated" or something like that. And Scott replies "Well you punched my heart so hard it disintegrated," and that's the end of the conversation. Oh, also, Ramona's other exes throughout and some other random dudes near the end are punched or hit so hard they disintegrate into a pile of coins, and no comment is made about whether they no longer exist, or whether they've been killed or what... There is a suspension of reality that comes from the video game culture in this. Also, at the end, Scott gets a second chance after the first Game Over (he dies and then goes back to the save point). Which brings up a whole other question: those other guys that got Game Over, are they just dead or do they get a second chance, too? If they did get a second chance the whole storyline would crumble. Only the main character gets the second chance. This is kind of the point where it really is definite that this movie is like a video game you're watching. You can't tell what's real and what isn't. What is part of the narrative and what is just a joke? Is it both? It doesn't help when almost every sound that is made is accented by comic book sound-effects, much like the original Batman TV show. Another part of postmodern film is "hyperreality/altered states." In Scott Pilgrim vs The World, at least in the beginning, there are these weird dream scenes that don't really make a whole lot of sense, and aren't mentioned for the rest of the film. And Ramona tells Scott that he has a kind of convenient hyperspace highway or something like that in his head that she likes to use. Also, I wonder if slow-motion be counted as hyperreality? Because there's lots of that going on in all of the fight scenes. Another trait of postmodern film that is used in this movie is "More human than human"... no real explanation is given for how Scott suddenly knows martial arts or has these mystical powers... though this does lead back to the constant references and pastiche of video game culture and humor. A suspension of reality is required in order to follow the story at all. 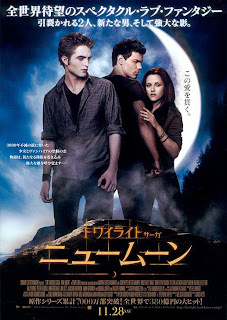 The whole movie is also based on the premise that is essentially like a video game in nature. Scott sees something he wants, and goes on a quest to get it. There are levels, one for each Ex that he defeats, and when he does defeat them, he gets life points and coins, shown in symbols and video game noises. There's even one point which he uses the restroom and next to his head appears a "Pee Bar," which reduces as he pees. The font and the symbol are both pixelated like a vintage video game, as are most of the other symbols and fonts used throughout the movie. Oh, and also, Scott gets another chance at the end after the first Game Over. That only ever happens in video games. Overall I guess you could say that the movie itself is not only an homage to video games, but a postmodern pastiche of them as well. 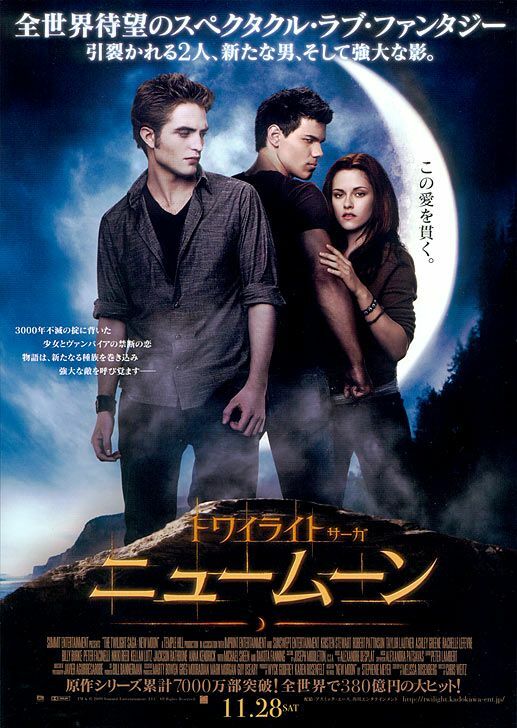 This includes the graphic novel from which the movie is based. It's an homage to the graphic novel, which is an homage to other graphic novels, and anime, and manga, and vintage video games, and indie rock, and... the list goes on. Its narrative is informed by the postmodern and is an exemplary movie of the genre.